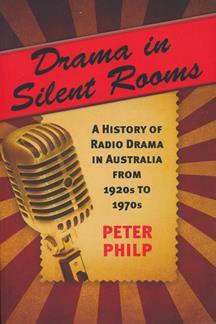 Drama in Silent Rooms is the history of the Australian radio drama - play and serial, produced by the ABC, commercial radio networks and independent radio production studios. Drama in Silent Rooms covers the radio drama story from day one, when the first play was produced in Melbourne by 3LO and concludes with the final broadcast of Australia's most famous serial, Blue Hills. However an epilogue is included of every event that has occurred in radio drama up until 2016. The story is told by the leading actors, writers, producers and management of production studios., people like Ruth Cracknell, Rod Taylor, Dinah Shearing, Lyndall Barbour, Leonard Teale, Bud Tingwell, Patricia Kennedy, Morris West, Donovan Joyce,and Grace Gibson. The author has also been given rare access to personal letters and documents from key players in the radio drama industry. Drama in Silent Rooms documents the social, political land industrial events that shaped this industry. The author argues that the Australian radio play and serial was far greater than mass entertainment: It was a legitimate form of art. The Australian radio actor was regarded as the best in world and that is why actors from Britain, US and Canada came to Sydney and Melbourne to play in our radio productions. Australian radio drama had an international distribution market. Drama in Silent Rooms is also a registry of every major radio play and serial made; has an extensive index and lists all major awards prersented during its era. Drama in Silent Rooms is a story for those who want to read about their favurite popular serials; those interested in the serious classical productions and students who wish to study this extraordinary period. The author desrcibes Australian radio drama as ' as a unique cultural and artistic moment in Australia's history'. Peter Philp's career has been as a broadcaster, writer and producer. He worked with 3KZ, Melbourne for 12 years, among some of the legionary names in entertainment. He has been a TV presenter and journalist, a feature writer with the Melbourne Sunday Herald, Managing Editor of the Melbourne Advocate, National Media Director of World Vision, and Media Manager of the Country Fire Auithority. An earlier book, Journey With the Poor,(CollinsDove) is about the conflict, termoil and political intrigues of Latin America, where Peter worked as a journalist. He has written extensively for Australian and overseas publications about major crises in Africa, including on the spot stories about Ethiopia's worst famine in history in 1984. Peter is a broadcasting historian, writing and producing a number of documentaries about radio and was executive produicer of 'A Day on the Dial'performed at the Melbourne's National Gallery. He has written specialized features on the Eureka Stockade and its leader Peter Lalor.Peter Philp is the great great grand son of the Eureka Leader. Peter is married to Nain who is also a broadcaster and writer.